The first national estimate of U.S. wild bees suggests they're disappearing in many of the country's most important farmlands--including California's Central Valley, the Midwest's corn belt, and the Mississippi River valley. If losses of these crucial pollinators is happening, the new nationwide assessment indicates that farmers will face increasing costs, and that the problem may even destabilize the nation's crop production. But it is happening? The problem with estimates is that the public is already jaded by claims of a honeybee collapse that never happened. Honeybee colonies can at least be estimated with some idea on accuracy, but there are over 25,000 species of wild bees and no idea how many there are. There are at least 4,000 species just in the U.S and only a few have hives to count. Nonetheless, a paper in Proceedings of the National Academy of Sciences produces an estimate, a map - and a warning. 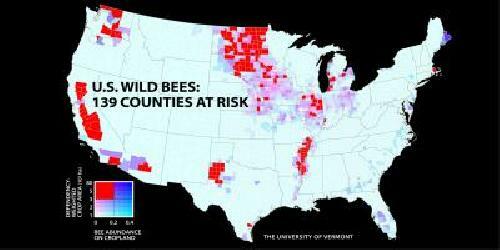 Scholars led by Insu Koh at the University of Vermont estimate that wild bee abundance between 2008 and 2013 declined in 23% of the contiguous U.S. They also say that 39% of US croplands that depend on pollinators--from apple orchards to pumpkin patches--face a threatening mismatch between rising demand for pollination and a falling supply of wild bees. In June of 2014, the White House issued a presidential memorandum that "over the past few decades, there has been a significant loss of pollinators, including honey bees, native bees, birds, bats, and butterflies." The memo noted the multi-billion dollar contribution of pollinators to the US economy--and called for a national assessment of wild pollinators and their habitats. There was little science in that warning and the panel this year was a little more modest, calling on activists in academia to stop exaggerating the impact of winter deaths and to engage in less data dredging. A call for seven million acres to be set aside as "pollinator habitat" was dismissed by experts, since bees are not confined to a geographical area so aggregating them artificially would do no good for pollination. Despite the White House finding otherwise, Taylor Ricketts, the senior author on the new paper says bees are in decline and identifies 139 counties in key agricultural regions of California, the Pacific Northwest, the upper Midwest and Great Plains, west Texas, and the southern Mississippi River valley that have the most worrisome mismatch between falling wild bee supply and rising crop pollination demand. These counties tend to be places that grow specialty crops--like almonds, blueberries and apples--that are highly dependent on pollinators. Or they are counties that grow less dependent crops--like soybeans, canola and cotton--in very large quantities. How did they count wild bees when no one else has been able to do so? They didn't, which means it adds to the list of PNAS papers that can't possibly have been peer-reviewed. The team instead identified forty-five land-use types from two federal land databases and asked fourteen hand-picked experts about each type of land and how suitable it was for providing wild bees with nesting and food resources. They then averaged the experts' input and levels of certainty (no, really) and built a computer model that they think predicts the relative abundance of wild bees for every area of the contiguous United States, based on their quality for nesting and feeding from flowers. Lastly, they validated their model against bee collections and field observations they also hand-picked. In other words, they created an academic model that would get them fired from every single company in existence for being wildly suspect and based on too many assumptions. The authors then claim the decline they don't know is happening must be due to pesticides, global warming and farmers. This passes for a study in Vermont, it just does not pass for a study in science.